MarketBrowser Tutorial #2 - Research: Comprehensively & Fast. Patented Universal Drill-Down Tool - Unique in the World -- And Fast. When markets are soaring, how do you make sure you are picking the best stocks at the right prices? In this tutorial, we'll explore MarketBrowser Advanced Edition's patented research system. 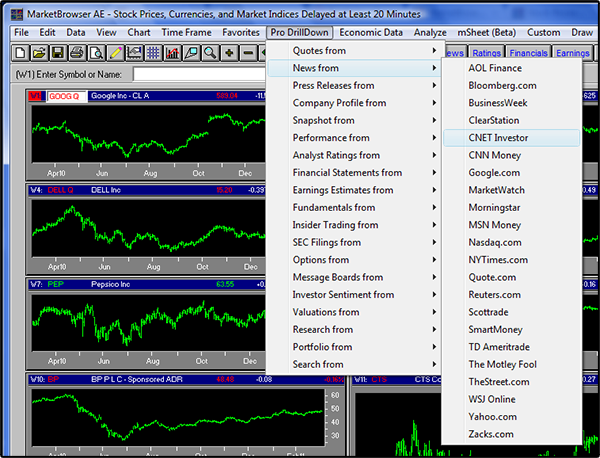 MarketBrowser AE's Unique Drill-Down™ Menu provides instant online access to hundreds of symbol-specific sources. This means that you can assemble a comprehensive, authoritative, corporate research packet with just seconds of work. 1. Patented Universal Drill-Down Tool -- for Research and More! Presto! Your browser opens the relevant article in a new tab! Repeat this one time or one million times and watch as your browser assembles a multi-tab, comprehensive research packet for you to review & share!